Matia Island State Park is a 145-acre marine park with 20,676 feet of saltwater Shoreline on the Strait of Georgia. 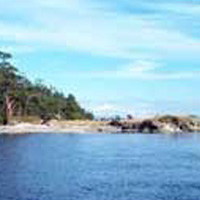 The island is part of the San Juan National Wildlife Refuge. Under a mutual agreement between the U.S. Fish and Wildlife Service and the Washington State Parks and Recreation Commission, five acres at Rolfe Cove are available to boaters as a marine park.Rolfe Cove on Matia Island offers six campsites, a sandy beach, one picnic site and a compositing toilet. There is no drinking water available on the island. Matia Island is a federal wildlife refuge and has use restrictions different from most Washington state parks. With the exception of the campground area at Rolfe Cove and the loop trail and its beaches, the island is closed to public access and use to protect habitat and wildlife.The park features good fishing and diving in waters around the island. There are interesting geological formations and an old-growth forest. Here's the our members favorite photos of "State Parks in Washington". Upload your photo of Matia Island State Park!